Join Photographer David Rocco at the White Plains Public Library’s Museum Gallery for a “Meet the Artist” reception on Saturday, March 2, 2019 from 2 to 4 p.m.
Westchester County photographer, David Rocco has traveled aboard helicopters, trains, boats, and to locations in Rockland and Westchester Counties, Port of Coeymans, NY and Williamsport, PA to capture the new Tappan Zee/ Gov. 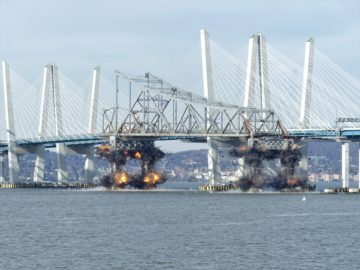 Cuomo Bridge’s construction in over 10,000 action and progression images. The result of his relentless efforts include numerous breathtaking aerial-photo close-ups of the emerging bridge towers, which now top at 419- feet high, as well as waterfront views of tug-boat teams at work throughout the seasons including their efforts in retrieving two loose barges which held two sets of steel assembled deck sections that floated eight miles down the Hudson River. The exhibit will run from February 4 through March 22.